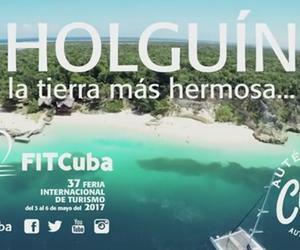 The 37th edition of the International Tourism Fair "FitCuba 2017" foresees today a tour of Cayo Saetía, a tourist destination considered as the largest hunting ground in the country with a wide variety of species. Located at the entrance of Nipe Bay in the municipality of Mayarí, the key has 42 square kilometers of extension with great forests that serve as shelter to a diverse fauna including whitetail deer, zebras and antelopes. Gaviota hotel group, in charge of its administration, has tried to conceive the site as a natural park, so that Cayo Saetía has a virginity not invaded by the action of man, conserving even its original flora and fauna. This activity joins to the permanent exhibition of tourist products from the stands located at Playa Pesquero Hotel, headquarters of the event. Emilio Ortiz, manager of Paradiso Travel Agency in the province, described the event as an opportunity to publicize Holguin's cultural product, especially its major international events such as the Gibara Film Festival, the Romerías de Mayo Festival and the Feast of the Ibero-American Culture. FitCuba 2017, for the first time in eastern Cuba, brings together tour operators, travel agents, airlines and Cuban and foreign suppliers.